If the citoid map contains pages and no such data was provided by citoid, we should prompt the user to enter a page number. @Esanders will mention corresponding ticket. See also T216775 which is related to entering ISBNs. @Mvolz Does this make sense as a proposal? I think it makes sense. The main issue is that we actually don't have a great way to re-use citations with a page cited in ve in general. 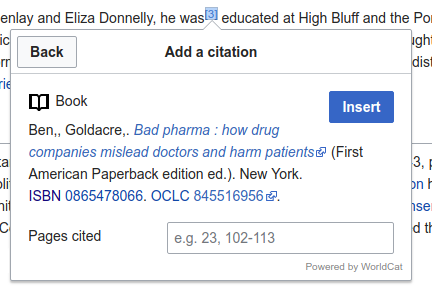 So if we prompt someone to do this, there will be more cases where someone wants to re-use a citation, but it has a page number cited, and they may re-use the citation even though it's citing a different page number. But I don't think it should stop us from doing it. Actually is there a way to offer a similar context in the re-use tab? Yes, we should. The added complication would be that if you added/changed the page number we would have to clone the citation, which ties it to some of the stuff @matmarex has been thinking about.